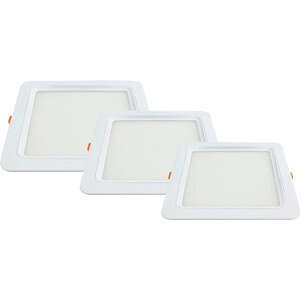 Energy-efficient LED panel of OPTONICA LED in space-saving, square design with a luminous flux of 375 lumens with only 6 W power consumption. The LED panel uses a beam angle of 120 ° for uniform illumination and is multifunctional mountable to ceilings and walls. Thanks to the latest "built-in driver" technology, the power supply is already integrated in the housing, so that the LED panel can be operated directly on the 230 V mains.